Sample bookplate. Click to enlarge. You have a unique opportunity to support the Library by sponsoring a yearbook. 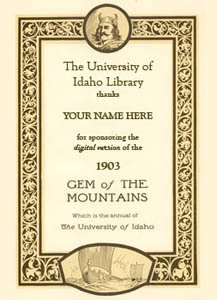 Gem Sponsors will have their names published on their selected yearbook's web page as well as on a digital bookplate (see right) inserted into the online yearbook. Gem Sponsorships are available for gifts to the Library of at least $1000 and the sponsorship will last for the duration of the website. Click here or on the button below to complete the Gem Sponsorship transaction or contact Dean Lynn Baird at lbaird@uidaho.edu for additional information. At the bottom of each digital yearbook page, there will be an option that allows viewers to digitally sign the page. Signing is free, but we encourage signers to consider making a donation to the Library. To donate, just click here or on the button below and be sure to mention Digital Initiatives in the comments section! The library needs and appreciates your help supporting our outreach, instruction, and engagement efforts. 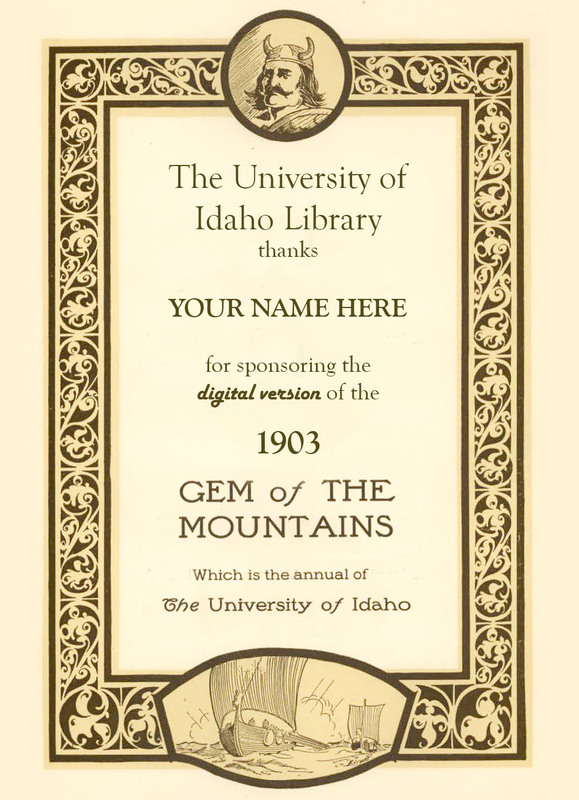 Please consider donating to us -- your support helps fund our librarians, our collections, and our facilities, as well as projects like The Gem of the Mountains Digital Yearbook Collection. Below are other library projects that benefit from your support.